Summary (Back of Book): Liza is a summoner. She can draw life to herself, even from beyond the grave. And because magic works both ways, she can drive life away. Months ago, she used her powers to banish her dangerous father and to rescue her mother, lost in dreams, from the ruined land of Faerie. Here at last is the sequel to Bones of Faerie, for all those fans of dark fantasy and dystopian adventure who thrilled to Janni Lee Simner’s unique vision of a post-apocalyptic world infused with magic. Wow! 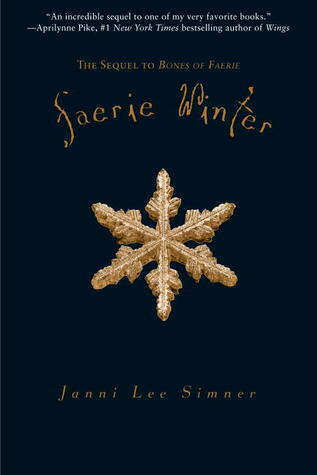 I just want to say Faerie Winter was kind of intense – in the best kind of way. A really good second novel. Liza and her friends have survived vicious plants, and stones that can burn you alive but now they have to survive an unnaturally long winter. Not to mention a very bad Faerie. The writing was again beautiful and the rules the govern magic in Liza’s world were still firmly in place, which can sometimes be a rarity in fantasy. I imagine it’s quite hard to remember every nuance those rules have, but Faerie Winter stuck to the rules set firmly in place in the previous novel. So a big YAY for that. Liza’s character development was a little slower in this one, but as she had grown quite a bit in the first novel, I think this was okay. She learned that the special oath Karin made her take was a promise to do everything in your power to not harm anyone, and to make decisions with the intent not to harm. Should you harm, you then must do everything possible to make up for that harm or fix it. Which, really, is a great lesson for a YA novel in my opinion. There were 2 major showdowns in Faerie Winter and they were really good. I was reading it yesterday while I was waiting at the doctors then lost my place, so when I got to the car I thought “Oh, I’ll just find my place and mark it again”. NO. I read four or five pages of the first showdown (because I was up to just before it began) and then realised I should probably drive away. Hence the ‘this was intense’ comment. Definitely waiting for the third and final book, Faerie After.